The artistic process is inspiring to follow. Here I show the process of carving stone and wood. Stone fascinates people. In our unconscious mind we think of stone as an ancient symbol that endures for an eternity, so people often ask me:"How in the world do you carve stone?" as if I had magic powers. First, any stone that is possible to carve is considered "soft" such as soapstone, alabaster, limestone, marble, granite, jade, etc. You probably cannot carve the stone in your backyard because it is igneous rock and extremely hard. There is "direct" carving and "concept" carving. I usually use the "direct" carving method as you see here which means I need to keep my imagination open and flexible to all possibilities of how to fit my idea into the given shape. Often the completed sculpture has more power because it has merged with the life force in the movement of the shape of the medium. I find that drawing daily is essential because it expands my vocabulary of design in life forms so I can develop my unique art language. 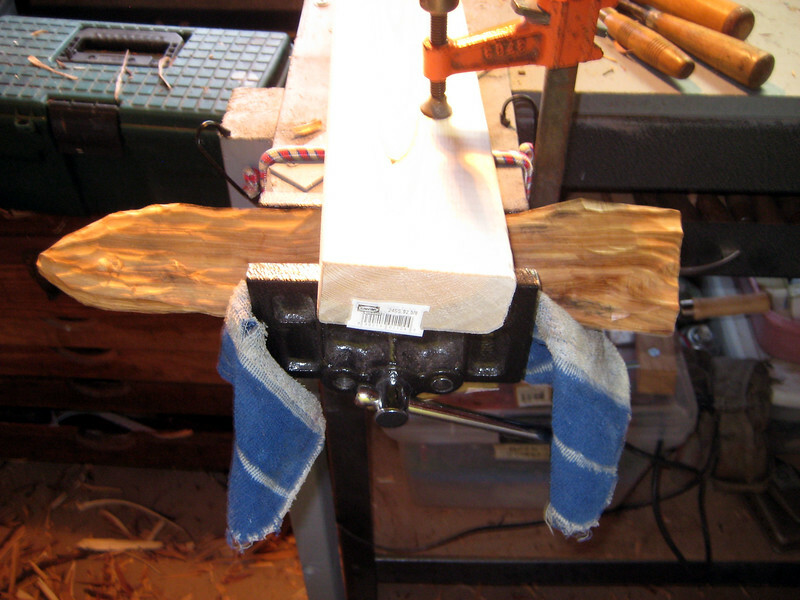 When the wood starts to slip in the vice I use a towel and a brace on top to hold the wood firmly in place while I carve.